Seasonal Occurrence: Uncommon fall through spring. Profile by Glenn Olsen: Fall is a wonderful time to be outdoors, enjoying the weather, the flowers, and the migration of birds, especially fall hawk migration. We have two species of accipiters that regularly occur on the Upper Texas Coast, namely the Cooper's Hawk and the Sharp-shinned Hawk. The best time to see them is during fall hawk migration when we have significant numbers of each passing through. Both the adult and the immature birds of each species are extremely similar in appearance and are easily confused when relying on the plumage for identification. The size, flight pattern, and structural differences of each species are more reliable features to distinguish the species than the plumage but even that is sometimes confusing. The Cooper's Hawk in adult plumage has steel blue-gray upper parts (back). The under parts (breast and belly) are rufous with white barring. The crown is usually darker than the back and this can aid in identification. 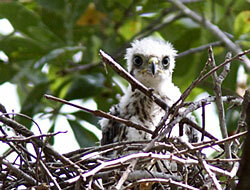 In this raptor group, females are usually larger than the males. The body of the Cooper's male is 14–16 inches long and weighs 10–14 ounces. Females have a body length of 16–19 inches. They can weigh from 16 to 24 ounces, but average around 18 ounces. Accipiters like the Cooper's have short, broad wings and long tails. This design suits them well for hunting smaller birds in open forests and scattered woodlands. In contrast, kites have long, narrow wings and short tails. The tail of the Cooper's has a rounded appearance in most positions. This rounded look is due to the graduated length of tail feathers with the outer feathers being shortest. When the tail feathers are closed, the graduated lengths produce the rounded appearance. When the hawk is in flight, look at the tail to see that the outer feathers are shorter. This is not as obvious as it sounds, so it takes practice to learn to see this. In flight, the head of the Cooper's looks large and appears to extend noticeably forward of the wings, giving it a somewhat long neck/head appearance. 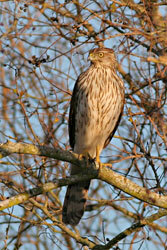 This is especially noticeable when compared to the Sharp-shinned Hawk which has the appearance of a retracted neck/head. Think of a turtle barely sticking its head out of the shell (Sharp-shinned) versus a turtle's neck fully extended (Cooper's). While we have a few Cooper's throughout the year, with an occasional nesting pair, we have more during our winter months. 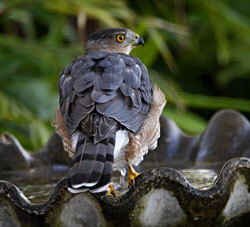 Your neighborhood, local park, or backyard feeder may have Cooper's Hawks during our winter months. 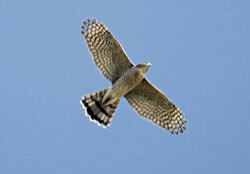 However, the best time to see Cooper's is during fall hawk migration. Smith Point Hawk Watch is a great place to visit during migration to see Cooper's, Sharp-shinned, and many other raptors.